Pride and Prejudice is a book by Jane Austen. It was published in 1813. It was made into a movie in 1940 and again in 2005. There were two BBC television productions, in 1980 and 1995. Elizabeth Bennet: A clever, witty, and pretty lady of twenty. She is brave, intelligent, cheerful and likes to laugh at odd people. Her family's vulgarity often makes her uncomfortable and ashamed. She is not as beautiful as her sister Jane, but she has an attractiveness. Mr. Darcy, who is critical about beauty, at first calls her "tolerable; but not handsome enough to tempt me..." However, he later realizes that "no sooner had he made it clear to himself and his friends that she had hardly a good feature in her face, than he began to find that she was intelligent". There are also many other discoveries, such as that her figure, though not perfect, is "light and pleasing", and her manners, though they are not fashionable, have an "easy playfulness." She does not know that he likes her at first, and when he proposes to her, she angrily and quickly says no to him because she knew he was the person who separated her sister and Mr. Bingley, and because she thought he was a bad man who was unjust to Mr. Wickham. When she finds out her mistakes, however, and he is polite and kind to her, she begins to change her feelings. When he helps her sister Lydia, she falls in love with him. He proposes again, and they marry happily. Mr. Fitzwilliam Darcy: He is very handsome, with a "fine, tall person (figure), with handsome features. He is very rich, with "ten thousand a year." He is also "clever". However, everybody in Elizabeth's town soon dislike him because he is too proud and cold to be pleasing ("his manners, though well-bred, were not inviting"), and they all like the cheerful and friendly Mr. Bingley better. Elizabeth dislikes him as much as anybody, but he is attracted to her because of her prettiness and "liveliness of mind." However, he much dislikes Elizabeth's family because they are so vulgar (he respects and likes Jane, though, and even says she is "pretty, but she smiled too much"). He learns to bend his pride, however, at the same time as Elizabeth gets rid of her prejudice, and loyally continues to love her. He is very kind to his sister, Georgiana Darcy, and loves her. Mr. Charles Bingley: a "good-looking, gentlemanlike" man. He is much friendlier than Mr. Darcy, and very cheerful. He makes friends everywhere he goes, and thinks Jane is "the most beautiful creature I ever beheld (saw)," and "he could not conceive (imagine) an angel more beautiful," and Elizabeth is "very pretty, and, I dare say, very agreeable." He is patient and very modest. He is not as clever as Mr. Darcy, but he is more "sure of being liked wherever he appeared." He is sweet-tempered and kind. Miss Bingley, his sister, says his handwriting is very careless, and that "he leaves out half his words, and blots the rest." Jane Bennet: Elizabeth's elder sister, who eventually marries Mr. Bingley. Lydia Bennet: the youngest sister. She runs away with George Wickham, though he has no intention of marrying her. She is 15 when the novel begins. George Wickham has known Mr Darcy since childhood. An officer in the army, he is superficially charming and rapidly forms an attachment with Elizabeth Bennet. He spreads tales against Mr Darcy, but eventually he is found to be the wrongdoer. He elopes with Lydia. This would have caused her complete disgrace, but Darcy bribes Wickham to marry her. Caroline Bingley: Mr. Bingley's rich but snobby sister. She tries to break up Elizabeth and Darcy, as she wants Mr. Darcy for herself. Lady Catherine de Bourgh: Mr. Darcy's rich and snobbish aunt. She tries to stop Darcy marrying Elizabeth. The story starts with Mr. Bingley, a wealthy, handsome young gentleman, who comes to town and rents a place near the Bennet family. He comes with quiet Mr. Darcy and his pretty sisters. Jane Bennet and Mr. Bingley begin to spend a lot of time with each other, even though the sisters of Mr. Bingley try to cut the attraction. Mr. Bingley is loved and admired by almost every woman in the town. Mr. Darcy is disliked by everybody, because of his arrogant way of talking and his mean attitude. Elizabeth Bennet, the second daughter of Mrs. Bennet, seems to despise Mr. Darcy. She despises him even more after he refused to dance with her at the ball. Elizabeth soon grows to admire an officer named Wickham. He seems to equally hate Mr. Darcy. He tells her a sad story about how Mr. Darcy was mean to him. This story makes Elizabeth hate Mr. Darcy even more. Meanwhile, Mr. Darcy begins to fall in love with Elizabeth. Bingley slowly begins to declare his proposal of marriage to Jane, when he suddenly has to leave to Netherfield. Netherfield is the house he lives at most of the time. He did not plan to leave for a long time but his sisters use this chance to move Bingley and Jane away from each other. The sisters follow Bingley to London. Bingley's quick leave makes Jane sad and confused. Elizabeth finds out that it is because of his sisters. Before Mr. Bingley leaves, Mr. Collins, the man who was supposed to inherit all of Longbourn (where the Bennet family lives), appears. The rich and pompous Lady Catherine de Bourgh had employed him as a clergyman. 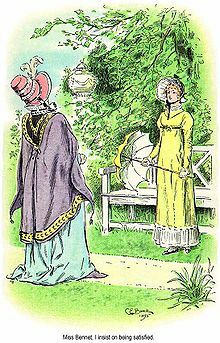 Collins wanted to find a good wife from the daughters of Mr. Bennet. He tries to take Jane as his wife, but after learning about the relationship between her and Mr. Bingley, he tries to marry Elizabeth. He proposes, but Elizabeth rejects him. Her mother is angry because Elizabeth could have lived in Longbourn if she married Mr. Collins. Then Mr. Collins turns his attention to Elizabeth's friend, Charlotte Lucas. He decides to marry Charlotte. They marry and Charlotte invites Elizabeth over to her house for a short visit. Elizabeth goes to Charlotte's house in the Spring. It is quite close to Rose Park. Rose Park is Lady Catherine de Bourgh's land. Mr. Darcy's aunt is Lady Catherine de Bourgh. He is staying there when Elizabeth visits and they meet. Elizabeth finds out that Mr. Darcy was the one who put an end to Mr. Bingley and Jane's love. She later rejects Mr. Darcy's proposal. She says all the mean thoughts she had about his cruelness towards Wickham and Jane and Mr. Bingley's relationship. Darcy writes an explanation to Elizabeth in a letter. Mr. Wickham almost eloped with Darcy's 15-year-old sister, Georgianna. Mr. Wickham had only wanted her money. Also, Darcy told Bingley not to propose marriage to Jane because he thought that she did not actually love him. Elizabeth returns home soon after and thinks about Darcy's explanations and all her misunderstandings about him. A few months later, Elizabeth visits Pemberly during her tour with her aunt and uncle. Pemberly is Darcy's land. Mr. Darcy meets them there. and is very kind to them during their visit. Mr. Darcy's kindness makes Elizabeth even more attracted to him. She also becomes friends with his sister Georgianna. Later, Elizabeths receives a letter from Jane. It contains sad news that their younger sister Lydia, has run off with Wickham. They find out that Wickham does not want to marry Lydia, but this would cause a scandal. Elizabeth and her uncle and aunt hurriedly return home. Elizabeth thinks that now Mr. Darcy will never speak to her again because of her sister's behavior. Then, Lydia and Wickham are found and are married. They later visit Longbourn. While describing her wedding to Elizabeth, Lydia talks about Mr. Darcy. Elizabeth sends an inquiry to her aunt because she is surprised. She learns that Mr. Darcy had paid for all the wedding expenses and paid Wickham to marry Lydia. Bingley and Darcy come to Longbourn. Bingley proposes to Jane, and she accepts. Mr. Darcy proposes to Elizabeth, even though Lady Catherine does not like Elizabeth. Elizabeth accepts the proposal. Jane and Elizabeth marry their lovers on the same day.